Glitter wine glasses are incredibly popular with Silhouette crafters. But if you're selling your creations, did you know you can make mock ups so you don't have to make an example in every color option?! 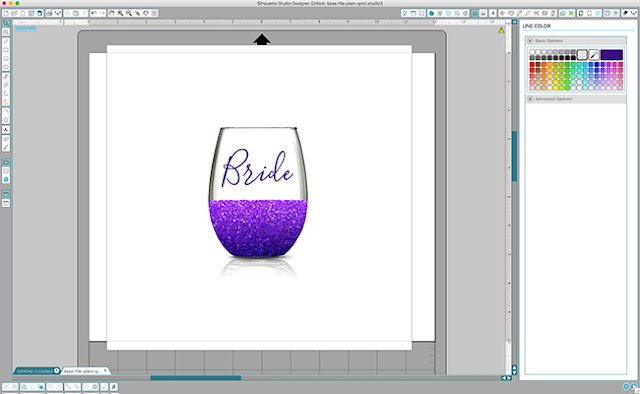 Sarah from Sarah Designs is back on Silhouette School today with a cool trick for creating a stemless wineglass mockup in Silhouette Studio where you can change the color of the glitter that's on the glass. The secret to this technique is the Shader Effects tool - an awesome feature that is often overlooked! And if you’re a glitter fan, you should also check out Melissa’s post about making your own glitter fill. I'm starting from a Photoshop file that I sell on Creative Market to get the base file. But you can download the base file (PNG) for free right here and follow along at home! Don't worry about if you don't have Photoshop - you won't need it and can skip ahead and meet us in Silhouette Studio. I'm just giving you options. The beauty of using the actual Photoshop file is that you have some cool automation options that you can do. And also the background can become transparent so you can put any color behind it, or you could put a background behind it or move it into a mockup scene creator. There’s one that I sell on Creative Market that this works really well with. So, if I took the glass and dragged it into my scene creator, I could make different scenes. Then just edit one time on the special “smart” layer in one of the scenes, and it is replicated into all the other scenes/layers automatically! Then you can easily export out all those different variations at the same time. So it’s really fast and easy to use the Photoshop file. 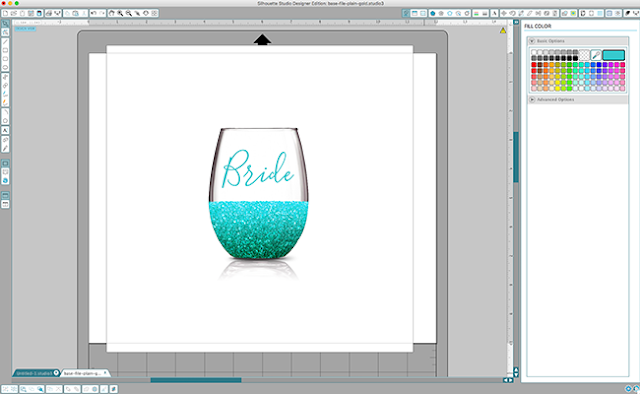 But if you’re a new business, you might not have invested in Photoshop yet so I made this tutorial to teach you how to do something similar right in Silhouette Studio! 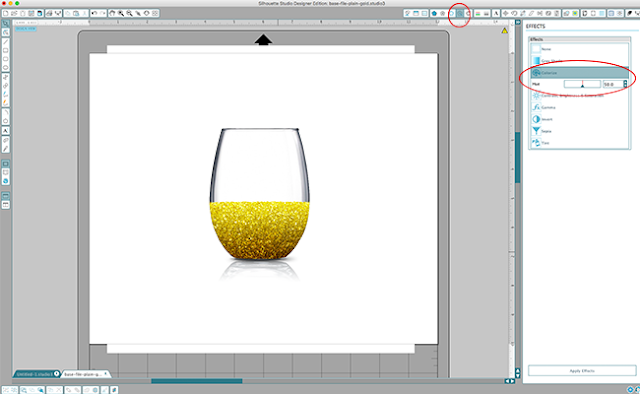 Go ahead and download the file above and open it in Silhouette Studio by clicking File, Open, (Command O on a Mac) then navigate to where that file is, “plain-gold.png”, hit OK, bring it in. It comes in small, so we'll just make it bigger. This is so easy! Click the wine glass image to select it. Then all you have to do is go up to the Shader Effects tool, which is right up top, seventh icon over from the left. It says, open the Shader Effects window. Once that’s open, then go into Colorize and just drag the hue slider around until you get the color you want. Pretty cool, huh? Say we want this purple (61.0 on hue slider). We like it, we hit Apply Effects. If we want to make it a little brighter, go into Contrast and up the brightness or lower it. I'm just going to leave it as is, because it was kind of effecting mostly the outside of the glass and not the glitter itself. Then you can come in and add your final design on top of this. I’m adding the word, “Bride.” I’m changing the font to Blooming Elegant which is my new favorite font. Click on the fill tool, grab the Eyedropper and just sample from the glitter itself to get a nice matching purple. Change the line color to transparent. 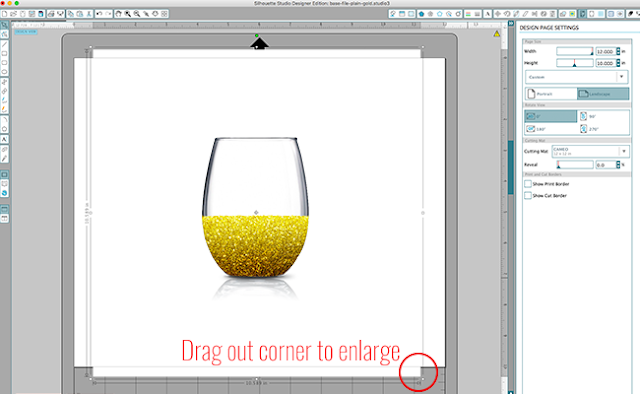 Then enlarge the text drag it on top of the glass. Super easy and quick. 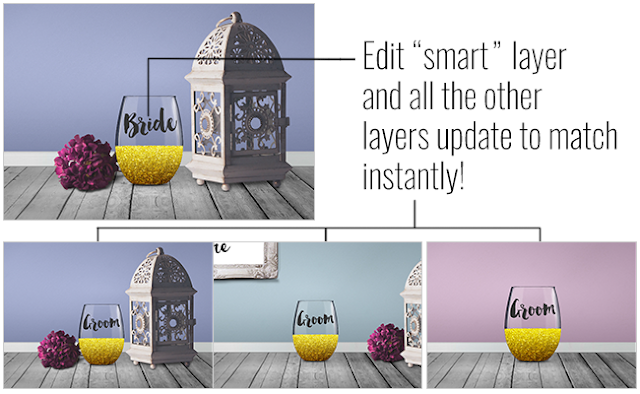 Now you have a mockup that you can show a potential bride for her wedding. 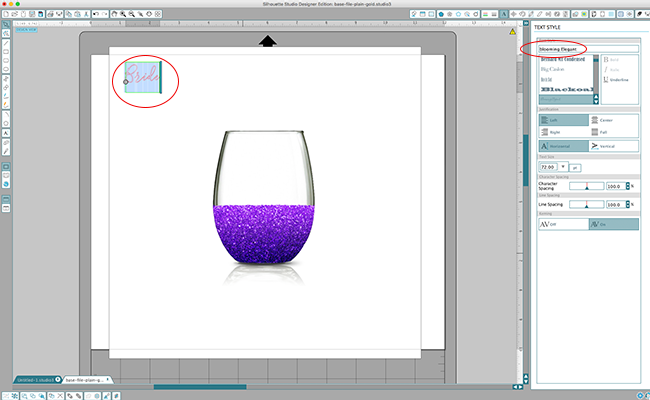 Remember, if you need to save mock ups from Silhouette Studio as a JPEG or PNG this is how you do it. Then you can very easily be like, "Oh, she'd actually rather have this in aqua. Let's go ahead and we'll grab the main file again. Go up to Shader Effects > Colorize, and then find more of an aqua hue. Hit Apply Effects, then grab the text itself, go to the Fill Color, use the Eyedropper again to sample the aqua shade and you have a new mock up. Isn't that awesome?! Don’t forget to download the free file so you can try this at home! I hope you found this useful and if you enjoy tutorials and these kind of mock ups and goodies, then you'll want to check out my website over at SarahDesign.com. I have courses on Photoshop and Mockups, as well as a styled stock library made especially for vinyl and etching designers (coming soon!). I hope to see you there.